This breed originated in the Pyrenees Mountains, hence the name. He is known by several different names - Great Pyrenees n America and Caada, Pyrenean Mountain dog in the UK and most of Europe. This is a stunning looking dog that was once known as the royal dog of France. It was bred to protect - livestock such as sheep and goats, people, children and in fact, anything it thinks should be protected, even furniture in your garden! They adore their owners and seem to think that their sole job in lie is to both guard and love their people. These dogs love carting, and are very often used in both therapy, where they excel due to their love of people, if well socialized, and rescue work. This dog is bit, coming in at about 58 - 72 kg! As you can imagine, with a dog this size, it is essential that it is fully trained, otherwise it will just become impossible. Being bred to be independent, can on occassion hinder the training as the dog may want to do things his way! Your best option is always positive reinforcement methods, and rather than have a long training session, have a few shorter sessions, or just incoproate your training into your daily life. First and most important aspect is can you handle this dog when fully grown? ​As mentioned below, this dog requirres extensive socialiazing, both to tother dogs and people. Not to do so can result in fear aggression. If this dog does receive the extensive socialization it requires, then they often do very well in both rescue and therapy work. This really is a question of what you put in, is that you end up with, and the extra socialization can take up a good amount of your time. 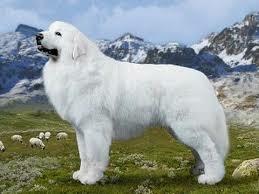 As above, it grows into a huge dog, so a lot of time has to be put into ensuring this giant of a dog will be fully trained and listen to its people, which will take a lot of time, and patience, but the end result of a really affectionate dog that adores and is protective of its family, is will worth the effort. Fortunately, this dog only required moderate exercise, however he does not tolerate heat well, so walks are better early morning of early evening. He is a drooler of note, and it is a good idea to dry his mouth off after drinking, or else he will drip water everywhere. They are also major shedders, and having a white coat, the hair shed is very noticable. Because of their natural instinct toward guarding, they can develop an excessive barking problem and will bark for anthing it considers to be a possible intruder, whether leaves falling on the roof, birds in trees, and perhaps even the dog he hears walking past the house. The continuous bark quite a few Pyrenean love to do is what can make them nearly impossible to keep as pets in urban or semi Rural areas. This is not a breed to take off lead when out for a walk. Due to their independent nature and their love of exploring, it could very well go 'walkabout' and not listen to a word its owner is saying. This is not a dog to be left alone outside for long periods of time. Not only will it become destructive, it will look for a way to get out - either digging under the fence, chew the fince, jump over it, and of couse the barking will accompany all these attempts to get out! It may sound that we are trying to put you off this breed - not at all! What you do need to know is what will be involved so that you will be prepared. The alternative of rehoming this magnificient dog due to its owner inability to the work involved, is simply not an option. Rather fully do your homework and make sure this is the breed for you. As this breed's job is to protect, this does not always make him a good canditate for living with other dogs, as it tends to resource guard - it's people, it garden, toys, food, balls etc. If the existing dog has not been well socialized, the do think again about bringing in another dog. This is definetely a dog that has to have early socialization as a puppy which continues. If not, he can develop fears resulting in aggression towards other dogs and also as he is bred to guard, he is a resource guarder of note, and this can be directed towards other dogs. If he receives the socializtion he requires then getting on with other dogs is not a problem, however, before bringing in any other dogs to the home, get professional advice to ensure that the existing dog will get on with the new comer, before the final decision is made. On average they do get on with other animals, but always better to socialize them from pups. Incredibly good and gentle with children, but must be introduced and socialized with them from being a pup. He has a watchful, protective nature and is more serious than many dogs. Children should always be taught how to approach dogs and treat them with respect. This large dog, as with most other large breed dogs is prone to bloat which can be very dangerous. Ensure that no excessive exercise at least an hour before feeding and 1 - 2 hours after feeding. Rather feed 2 to 3 smaller meals per day. Also try lifting the bowl higher up off the floor which can be helpful in preventing this condition. 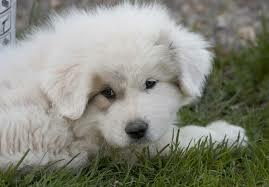 Cancer, especially bone cancer, claims the lives of many Great Pyrenees. They are also prone to problems with hips, elbows, knees and shoulders. They are susceptible to dieseases in both their eyes and eyelids that may require surgery or even cause blindness. another major concern is heart disease - they are prone to several blood-clotting disorders. This breed is also prone to allergies and some of the breed are born deaf or partially deaf. Deafness is a lot more common in dogs that are white than in other coat colours. In addition to sozialization at puppy school, do ensure that this pups meets as many different people, of all sizes and colours and that it develops excellent social skills. Give daily, regular exercise of about half an hour. As barking can be a problem www.friendsofthedog.co.za/barking-excessive-barking.htmlit is better to teach this dog, right from apup, to bark and sush on cue. Don't ever clip this breed - it has a double undercoat which is actually designed to keep it cool.